I was as giddy as a 5 year old when I arrived home from work last night. Before I left the office, I had checked the tracking number of a package I was expecting and it was due to arrive that afternoon. Sure enough, the package was at the front door when I got home. After having received a Garmin Forerunner 305 as a birthday present 2 1/2 years ago, I have not been running without it. It has become as essential as my running shoes, at least for me. However, 6 months ago I decided to upgrade to the Garmin Forerunner 405, for which I had found an absolute steal of a deal on Craigslist.org. I just liked the new smaller design and the touch bezel and all of the other cool features. As you can tell, I am a sucker for tech toys. I plan to review both of those devices in the near future as well. In brief, while I certainly liked the 405 with all of its great features, it was exactly some of those new features that also became its biggest drawback. The touch bezel, for example, while certainly a cool feature, also created big problems on my runs. Any type of sweat or rain would cause it to activate and select random features. To avoid this, I was able to lock the bezel while still being able to start and stop my workouts with the side buttons. However, locking the bezel also locked the back light feature, so I was unable to read my Garmin during my early morning runs without deactivating the bezel, etc. In short, it was not worth the effort. Second, I had just finished my second 50K ultra trail marathon and realized that the battery life wasn't quite up to par either. While the 405 made it all the way past the finish line, it did die on me shortly thereafter. If you look at my upcoming races at the bottom of my blog, you will realize very quickly why that is a problem. I have a 12 hour race and a 108K race coming up and I really do not want to run out of juice during these runs. Enter the Garmin Forerunner 310XT. This device addressed all of my concerns for long distance running and training. It basically combined the best of both worlds from both the 305 and 405. It has a great large display (like the 305) but is slightly less bulky. Its buttons are also very user friendly (like the 305). It has wireless connectivity through the ANT stick (USB stick) and automatically transfers training logs to Garmin Training Center and Garmin Connect Online (like the 405). It also allows you to wirelessly transfer workouts and courses to and from the 310XT. However, the biggest selling point was the average battery life listed for this device, up to 20 hours. This should cover all of my upcoming ultra goals nicely. I do not have plans for any 24 hour races in the near future, so I think I'm covered. In addition, it has some great features for triathletes as well. Since that is not a sport I am pursuing, I will leave commentary to those feature to people who know. When I first started the unit up, its setup wizard walked me through the initial setup. This was a very easy and straight forward process. It covered questions like gender, age, activity levels, etc. After that, I proceeded to set up and pair my heart rate monitor (HRM) and Foot Pod with the 310XT. While this was also fairly easy, it did require some reading of the manual to find the appropriate screens. If you are anything like me, you prefer to set up any tech device without having to refer to the manual. At least I like trying that approach first. After finding the appropriate screens and selecting the appropriate options, it appeared that the pairing succeeded, but I could not be sure. It confirmed that it had found both the HRM and Foot Pod, but it did not offer any other confirmation. Additional options on the HRM and Foot Pod setup screens only added to my confusion. The only way to confirm success was to go and put on the HRM and go for a run, which is exactly what I did this morning. I am happy to announce that the 310XT was everything I had hoped for. Everything worked right away and as expected. No problems at all. Overall, I am very happy with th3 310XT and its feature set. The Garmin Forenunner 310XT is a huge improvement over all previous devices. I will add more information as I continue to use this gadget. Kraut, I'm thinking about buying the Garmin 310, as both my old Suunto and RunKeeper on my iPhone 3GS are not working satisfactory on my Trailruns. I've had RunKeeper give me as much as 800m off when running 13k on a well lit, run-dedicated and measured dirt track. 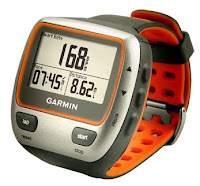 So I wonder what your thoughts are on how the Garmin 310 works when trailrunning, how well does it work? I've heard and read it does have some software issues, luckily they (Garmin) do provide regular software updates. But how do you feel about the accuracy of the GPS while trailrunning in a forest? Anonymous, I have nothing but good things to say about the Garmin FR 310XT. I have used it satisfactorily for close to a year. The deviations in regards to distance measurements have been minimal and I do most of my running on mountainous trails with lots of tree cover. There has only been one race (50 km) where the FR310XT was off by 3 km, but that was true for all GPS units used by runners during this race due to the nature of this particular course. On a 100 mile race last month that was run exclusively on trails, my forerunner was only off by 0.5 miles over 100 miles. That's nothing. Add to that the battery life (20 hours) and all of the other training data you receive and you have yourself a winner. In addition, the Garmin customer support here in the US has been second to none. I have been using the FR series for the last three years (305, 405, 310XT) and when I did have issues they resolved them immediately and without any cost to me. Hope this info helps. If you have specific questions, feel free to email me directly. I think you just convinced me to buy it. I been close for a while now, but found very little online from independent sources about how it performs on the trailruns. I was a bit worried about that it would be too inaccurate, but 0.5 on a 100mi on a run on a forest trail is pretty sweet. You can find the best and latest article.